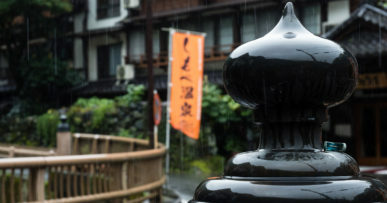 My second visit to the charming Kurokawa onsen happened rather spontaneously: I was planning to spend some more time enjoying Kuju and Aso scenery on my last day on Kyushu, but the weather deteriorated, and a hot spring bath is one of those places where it doesn’t really matter if it rains or shines. 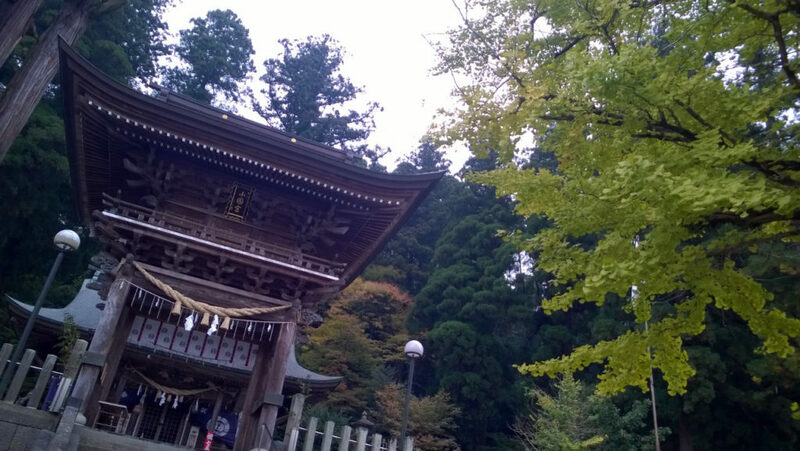 I remembered how good it was in Kurokawa when I went there 10 years earlier and decided to go again. It’s half an hour drive from Kuju. 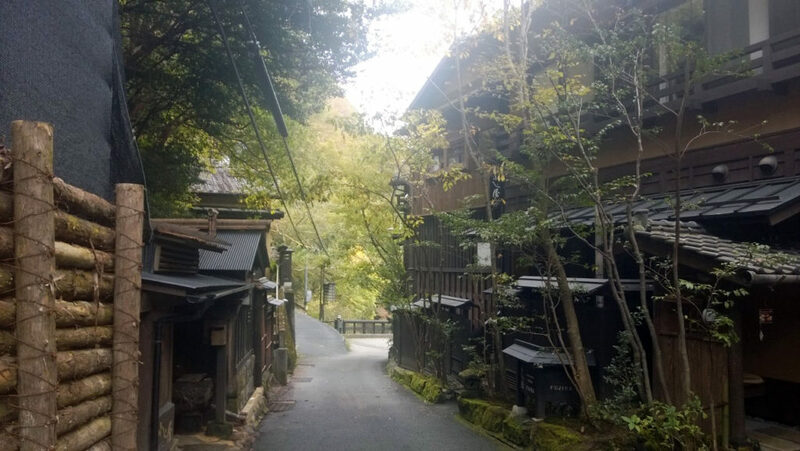 Kurokawa onsen is often called one of the best hot spring towns in Japan; I would say that it’s absolutely the best – and I’ve been to many hot spring towns in most prefectures, so I have a good perspective. 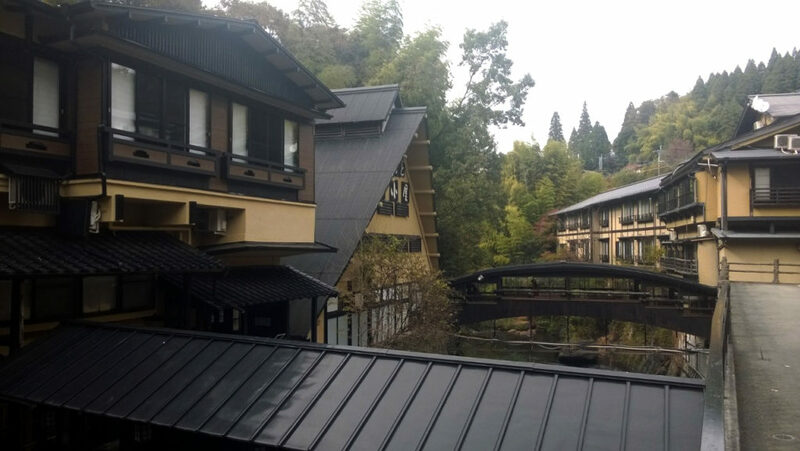 The reason why I feel this way about Kurokawa is because not only does it have great quality of water and outstanding outdoor baths, it’s also visually appealing. 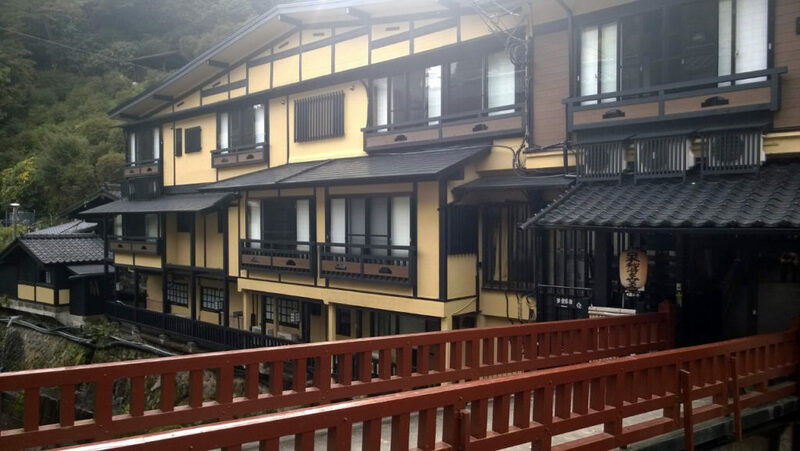 Nowhere else in Japan have I seen such level of synchronicity in how separate ryokan buildings look: they all have the same sandy brown traditional appearance, which gives the whole place uniformity and style. It’s a really small village, basically just one main street, but still, I see some considerable effort being made here. Unusual and admirable. And then, of course, there are the baths. 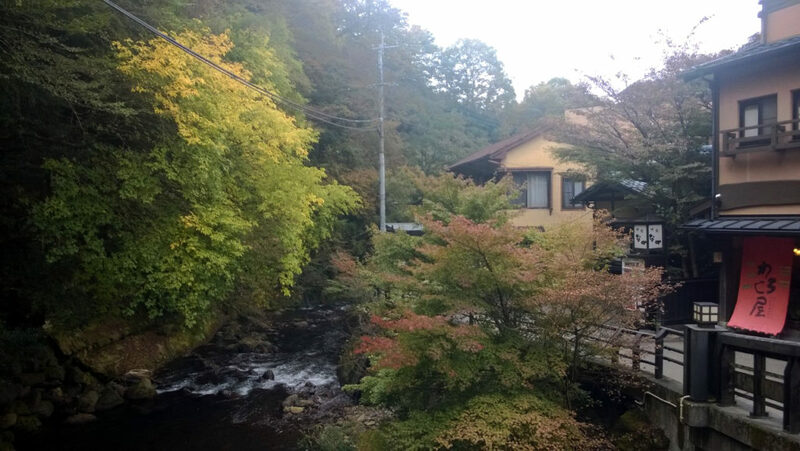 My favorite baths are at Yamamizuki, a ryokan located on the outskirts, 2 km away from the main street (it’s either a short drive or a 30 minutes walk). 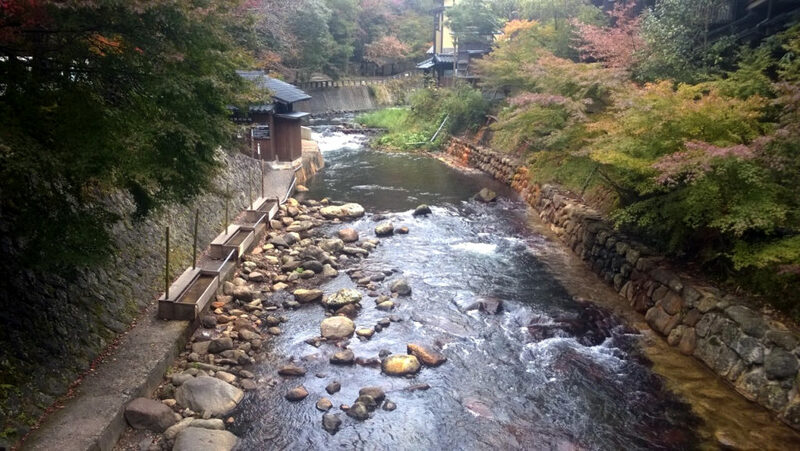 Their rotenburo in near a river with a small waterfall, you soak and have this waterfall right in front of your eyes. 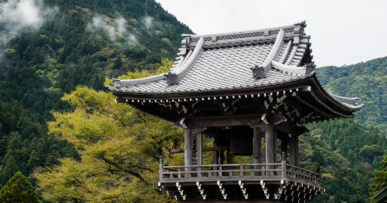 Another bath is in a wooden building with big windows opening into a forest; if you visit in November the fall colors there will be beautiful. I want to stay overnight there sometime. 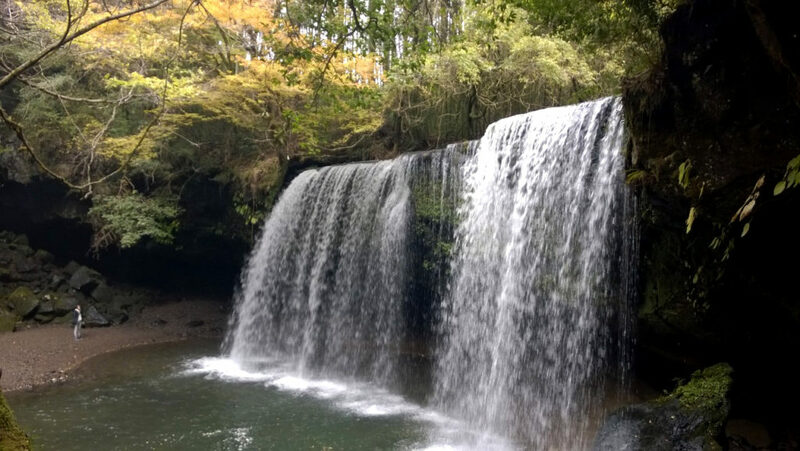 On my way to Kurokawa I stopped at Oguniryo Shrine and Nabegataki Falls, a beautiful waterfall with a cave behind it where you can see the water falling from the other side. Alas, no good photos. Camera died on me a few days before – I only had a cell phone. This concludes my 2016 trip around Kyushu. I arrived to Kokura by shinkansen, then went to Usa on express train, rented a car for 2 days and made a half-circle around Kunisaki peninsula. 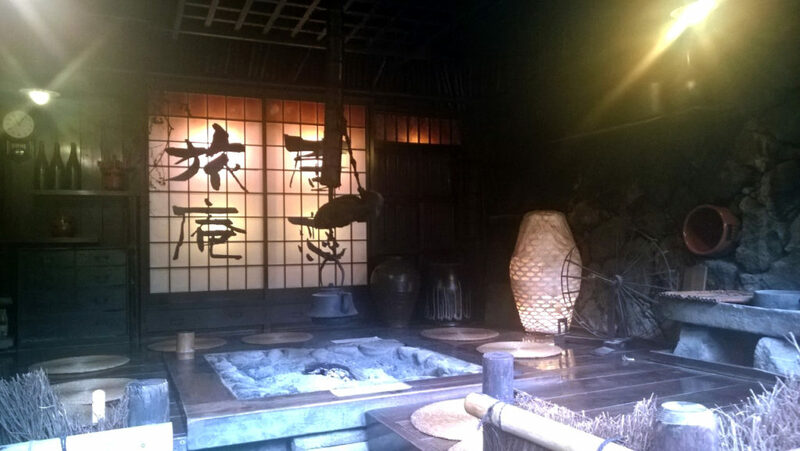 I then stayed for one night in Beppu, visiting Kitsuki on a day trip, and stayed overnight in Yufuin. From there I fast tracked to the opposite side of the island, to Saga city in Saga prefecture, saw hot air balloons and visited Karatsu (and saw Karatsu Kunchi festival) on two day trips. 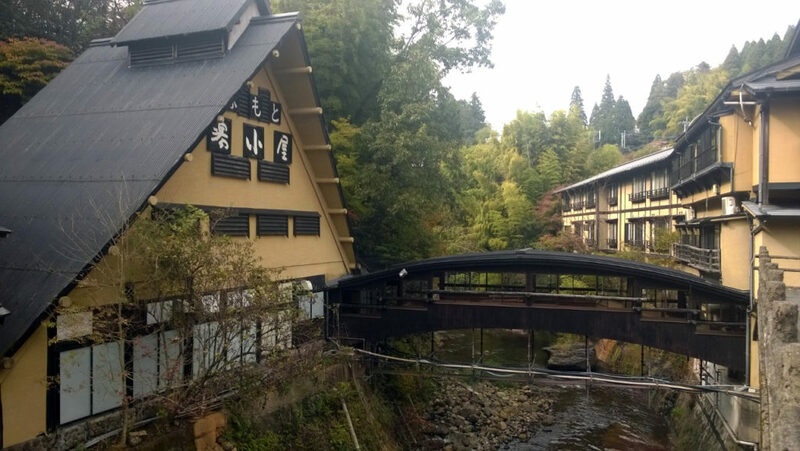 I also briefly stopped at the porcelain makers’ village of Arita before heading to Kumamoto, where I rented a car again for a total of 5 days and spent them exploring Aso, Takachiho and Kuju. From Kurokawa onsen I went back to Kumamoto, returned my car, and took the shinkansen to Osaka.